when trying to feed 5000 you need some good recipes! It is well known that I have set myself a slightly insane life goal of feeding 5000 people in my home, and in order to do that I have developed some fail safe recipes that I know are tasty and easy to cook. This means that I can spend more time with the people who come into our home and less time worrying in the kitchen! 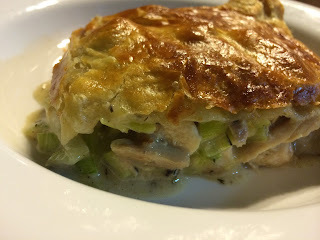 So today I wanted to share with you one of my favourites- chicken and leek pie. Lets face it, who doesn’t love a nice tasty pie, especially in this dismal weather. I have adapted this recipe over the last 7 years and it is one of the few that I keep making over and over again (it is just that tasty!). Mix in the flour and cook for 1 minute, then stir in the chicken stock slowly. Turn on the oven to fan 200°c or regular 220°c and put the shredded cooked chicken in a pie dish. Put all the mixture into the pie dish, mix and cover with the pastry. Brush with egg and make a steam hole in the centre. You can easily make this up earlier in the day ready to chuck in the oven later in the day when your guests arrive.